Its a Wednesday, and that means i’m eating at parents house which means, wine time! I recently introduced by friend the wine bug to my dad and since then, we have been enjoying a bottle of wine every Wednesday. 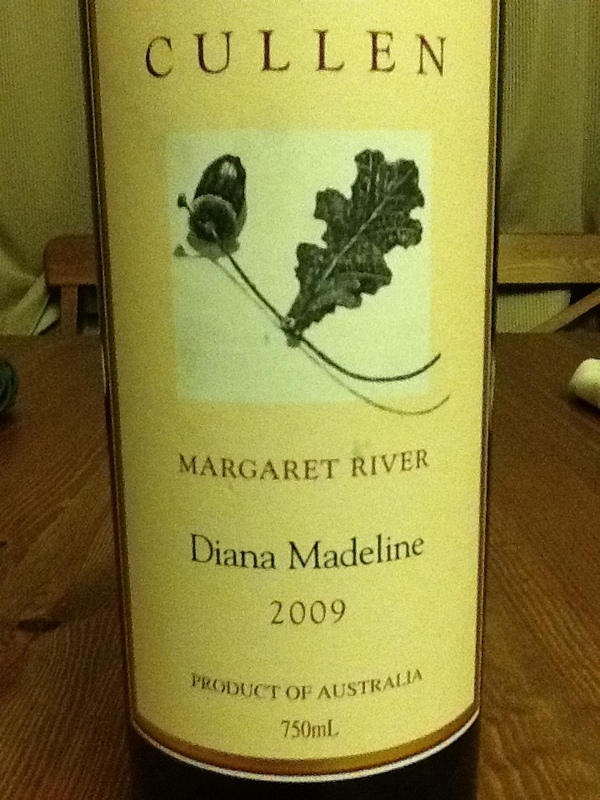 Today we are in for a treat, Margaret River’s Cullen Diana Madeline 2009 Cabernet Merlot. Margret river is situated in WA and this wine comes from the sub region Wilyabrup. Made by Vanya Cullen, daughter of Diana, this is noted as one of Australia greatest Cabernets. Some serious badassery. This bad boy is 88% Cab sav, 6% cab franc, 4% merlot and 2% malbec, coming in at 12.5% alco. Oh and btw 2009 was a wicked vintage. Looking good! We decanted this for about 2.5 hours with premise that, IF this tasted good (ha!) that we may venture out and snag a 6 pack or so. Sniff? crisp and clean, think of the freshness you get when you chop into an iceberg lettuce. Great mix of black fruits and berries with touches of red fruit and a sprinkle of grass (the normal kind). The nose is not all that exciting but it does give off an awe that there is something going on here. One thing I like is that there is no overpowering oak. To sum it up…this a gentile wine thats is all about elgance and finesse. Hits your mouth like silk, smooth, velvet and a fruity. Super balanced wine, perfect mix of dryness, acidty and fruit sweetness. Has an abilty to both feel heavy and light at the same time. Makes me think of brambles and undergrowth. There is definately lots of complexity and layers in this wine, definatly a thinking wine to ponder over some time. I get alot more fruityness now (2nd glass in) with a definate sense of vegital components followed by the earthy tones then comes a wave of sweet acidity, like a sugary grapefruit. Heaps happening in this wine. Love it. Finish lingers in the top front gums and the oak enters in the finish here for a well rounded mouth feel. Extremely mouthwatering, makes you want to drink more and more!